While searching for signs of Dalek activity in the vast depths of outer space, the Arecibo Observatory in Puerto Rico stumbled across a most interesting find. They were receiving modulated radio signals emanating from an invisible object about 25 light years away. The signals were all in the VHF band between 41 and 68 MHz. After a applying a little amplification and some wibbly wobbly timey wimey enhancements, it became clear what the signals were – 50 year old terrestrial television broadcasts. The site takes a minute or so to load due to the traffic its getting. [Dr. Venn], the radio astronomer who discovered the signals, was able to talk NASA into pointing the Hubble Space Telescope in the direction of the now officially named “Bounce Anomaly”, but was unable to see anything. Meanwhile, a BBC team has been working with [Dr. Venn] to recover the 50 year old signals and is attempting to reconstruct entire broadcasts – some of which are the very first Dr. Who episodes. Thanks to [PWalsh] for the tip. [TK] is a retro computer enthusiast who’s had some difficulty locating a joystick for his trusty Amiga 500. New ‘sticks are expensive, and battered survivors from the 80s go for more than they should. Happily these old controllers were simple devices, having only five control lines for the four directions and a fire button which were active low. [TK] therefore cast around the available components and decided to craft his own controller from a numerical keypad. Numerical keypads may be ubiquitous, but they’re not the perfect choice for a joypad. Instead of individual switches, they are wired as a matrix. 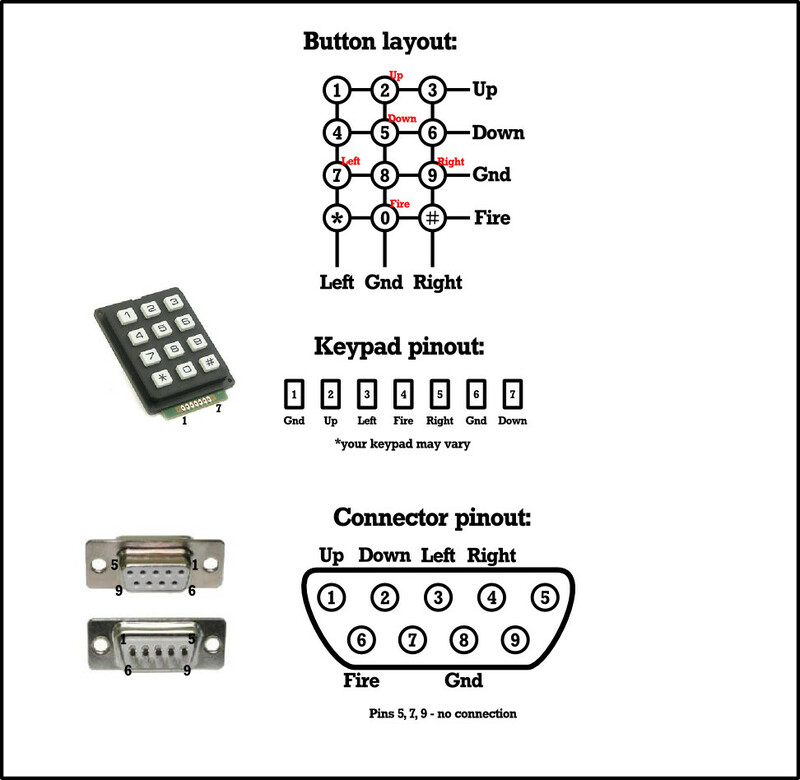 [TK]’s controller works within that constraint without butchering the keypad PCB, though his layout has the left and right buttons below the up and down buttons. Looking at the schematic we wonder whether the 4-5-6 and 7-8-9 rows could be transposed , though joypad layout is probably a matter of personal choice. Making the controller was a simple case of wiring the pad to a 9-pin D socket in the correct order, and plugging it into the Commodore. He reports that it’s comfortable to use and better than some of the lower-quality joysticks that were on the market back in the day. Veterans of Amiga gaming will understand that sentiment, there were some truly shocking offerings to be had at the time. Quite a few home-made game controllers have made it onto these pages over the years. There is this one using tactile switches and a ballpoint pen, and a stick made from the idler wheel from a surplus VCR, but the ultimate crown of junkbox joysticks should go to this joystick made from clothes pins. If we take one thing away from all this home-made controller ingenuity, it is that what really matters is not the hardware but the gameplay. Remember Pogs? They’re back, in OSH Park form! Some of you might be too young to remember, but the 90s were weird. If you need an example of this, you need only look at pogs. This was a schoolyard game using small cardboard discs and metal or plastic ‘slammers’. To play, stack the cardboard pogs, throw a slammer at the stack, and collect all the pogs that land face up. Of course, each cardboard pog was printed with full-color glossy pop culture images and were as collectible as comic books and baseball cards. The Bart Simpson ‘Public Enemy #1’ pog is highly prized. You could trade a pack of dunkaroos for three holofoils. I’m still looking for Animaniacs #27; my set is otherwise complete. 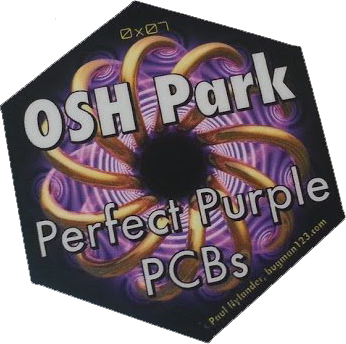 For the past few years, OSH Park, purveyors of perfect purple PCBs, put purple stickers into purple padded envelopes in each order. These stickers weren’t really anything special – just a rectangle with one rounded off corner, a gear, and the OSH Park URL. A few months ago, [Laen] at OSH Park ditched these plain purple stickers for something that taps into the same sentiment as the Apollo 13 pogs distributed through Hardee’s kids meals that included a modular Saturn V-shaped pog case and an aluminum slammer embossed on the obverse side with the Apollo 13 mission patch. OSH Park’s newest stickers are numbered, limited edition, and feature unique artwork for each sticker in the series. They’re also hexagons, allowing anyone to tessellate their love for OSH Park all across their laptop. These are the OSHexagons, OSH Park’s newest stickers. Right now, [Laen] is drawing up and releasing about one design per month, with seven stickers out so far. Holding fast to OSH Park’s ideal of open standards, the OSHexagons utilize the Open Sticker Standard (yes, there is a standard for everything), making these stickers a regular hexagon that can be inscribed in a circle two inches in diameter. While most of these stickers have runs in the thousands, OSH Park pulled a page from the history of pog and introduced a very special, limited edition OSHexagon. Only 500 of the beautiful purple and gold 0x03 stickers were produced, making these collectors items equal in stature to the famous zinc alloy Austin 3:16 pog slammer. As far as marketing goes, giving away a sticker with every order is pretty standard. The Hackaday Store includes a die-cut Jolly Wrencher with every order, but we order thousands of these every few months for events and shows. OSHexagon 0x03’s limited production turns it into an object to be cherished – coveted, even – that is easily digested by the gaping maw of fringe electronics trade journals and blogs. It’s a tour de force of marketing not seen since the 90s. What’s next for OSH Park? If we’re following 90s trends and fads, you would think Beanie Babies would be next. Luckily, they already have that covered. A $99 Smartphone Powered 3D Printer? What if we could reduce the cost of a photopolymer resin-based 3D printer by taking out the most expensive components — and replacing it with something we already have? A smartphone. That’s exactly what OLO hopes to do. The question is, does it work with a cellphone’s relatively weak light source?